Balloon is a mobile app that helps friends get together at a moment’s notice. People use their mobile devices to easily send out impromptu invites to groups of friends to join them at specific locations (meals, pick-up sports, parties). 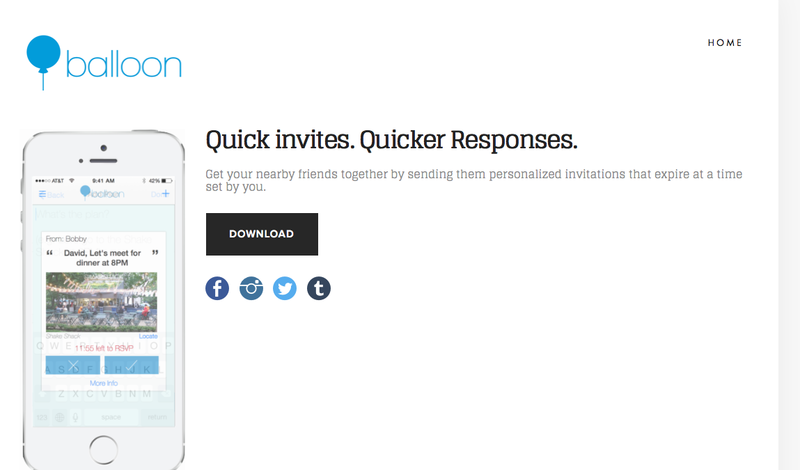 Nearby group members receive push message invitations, see who’s going, RSVP and meet. But here’s the special sauce: the messages are personalized, making it feel like a one-to-one invitation. So instead of receiving the group message and thinking, ‘meh, later,’ recipients are more likely to respond. Group members also get a reminder either an hour or 30 minutes before the event. Ah, psychology, but we can’t confirm that co-founder David Taitz studied that particular subject during his days at Harvard, which is where he was, attending classes, when he started working on the then-project in January. And not as effective as he would have liked. Balloon launched in the app store in July, and the feedback has been very good. That’s what he says, but then again, it’s more than just a day-of invite for events. He’s making plans for there to be ephemeral events as well. For example, you’re walking five blocks from, say, a J Crew store and you suddenly get a message that gives you a discount. All you have to do is say yes. Which could be a big plus for brick-and-mortar, or restaurants during off peak hours. Nothing draws people in quite like a discount.